Refer to your camera's manual on how to expose the sensor. Brush the sensor surface with Arctic Butterfly®, Sensor Brush™ or use Zeeion hurricane blower to remove any loose contaminants. Since simple visual inspection can not determine the nature of stain light or heavy, first start with either liquid. 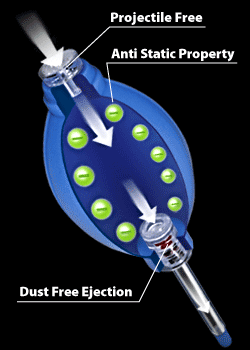 Add 2 to 4 drops of VDust Plus™ or Sensor Clean™ to edge of swab head. 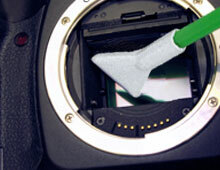 Wipe across the sensor with gentle pressure. Discard the swab. Allow the sensor to dry completely. Otherwise switch liquid, use a new swab proceed with cleaning. Proceed with checking the sensor with Quasar® Plus Sensor Loupe®. 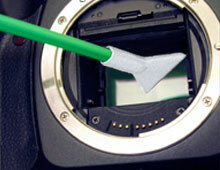 Highly recommend using the Arctic Butterfly® for a complete sensor cleaning. Do not add two liquids on the same swab. Use each liquid with seperate swab. Always swab in the same direction. Suggest blowing off with bulb blower to remove any fibers that may have shed in transport. 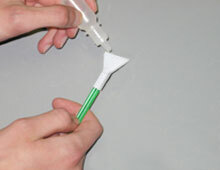 Apply cleaning liquid evenly across edge, taking precaution not to oversaturate the swab. Insert swab width wise to the width of the sensor. Rotate once inside chamber. Contact sensor so that swab width is edge to edge of the height of sensor. 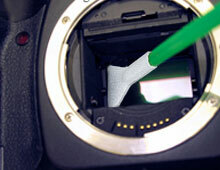 Wipe gently, firmly across width of sensor, edge to edge. Lift off sensor, rotate swab width to width of sensor and remove.